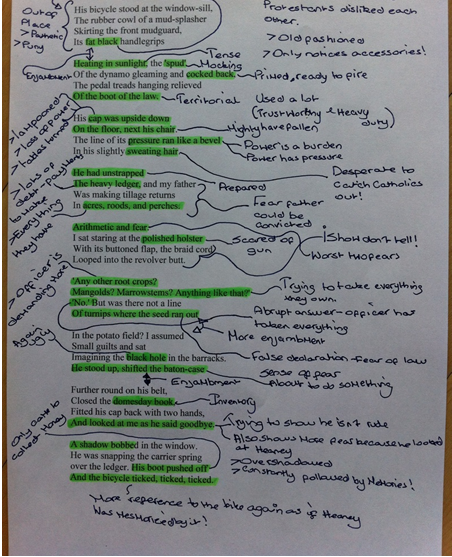 This a paper version of the poem which was analysed by us in short. When analysing a poem you always must look for the literal meaning and the metaphorical meaning, this is called an allegory. For example when looking at the phrase "A shadow bobbed" Literally we can identify Heaney portrays a shadow behind the departing constable, however it is more than this. Comprehending that the themes of the poem are childhood memories and fear, we as a group looked at the phrase and thought the metaphorical meaning was this event in Heaney's life always lingers in his mind and always comes back to haunt him, and just like a shadow - never goes away. Also it is important to do some background research, for example "in his slightly sweating hair" it would be difficult to work out he was trying to find any evidence to convict Heaney's father without knowing Heaney's family was Catholic and the police were Protestant at a time the two religions hated each other.